Does philosophy have a place in serious science? Many of the founders of modern physics certainly thought so. Einstein, Bohr, Heisenberg and Schrodinger were not just great scientists but they were equally enthusiastic and adept at pondering the philosophical implications of quantum theory. To some extent they were forced to confront such philosophical questions because the world that they were discovering was just so bizarre and otherworldly; particles could be waves and vice versa, cats (at least in principle) could be alive and dead, particles that were separated even by light years appeared to be able to communicate instantaneously with each other, and our knowledge of the subatomic world turned out to be fundamentally probabilistic. However, as quantum theory matured into a powerful tool for calculation and concrete application, the new generation of physicists in general and American physicists in particular started worrying less about "what it means" and much more about "how to use it". American physicists had always been more pragmatic than their European counterparts and after World War 2, as the center of physics moved from Europe to the United States and as the Cold War necessitated a great application of science to defense, physicists turned completely from the philosophizing type to what was called the "shut up and calculate" kind; as long as quantum mechanics agrees spectacularly with experiment, why worry about what it means? Just learn how to use it. Yet this only swept epistemological questions under the rug. 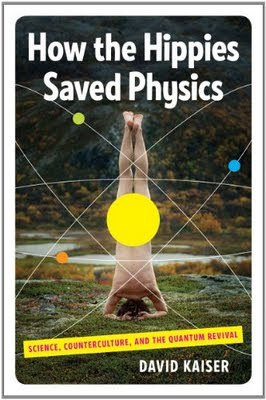 However, as Kaiser describes in this fascinating volume, this ragtag group of countercultural philosopher-scientists achieved at least one crucial goal; they kept questions about the philosophical implications of quantum theory alive at a time when most physicists eschewed and disdained such questions. Gradually, they managed to get a handful of mainstream physicists interested in their philosophizing. Much of the connection of this philosophy to real physics centered about a remarkable result called Bell's theorem which essentially reinforced the spooky properties of quantum systems by showing that information in quantum systems can flow instantaneously between particles. Remarkably, this seemingly otherworldly idea of "quantum entanglement" (which gave some of the founding fathers heartburn) now lies at the foundation of some of the most cutting-edge areas of modern physics, including quantum computation and the new discipline of quantum information science. What was considered far-flung by mainstream physicists and kept alive by the Fundamental Fysiks group is now serious physics for many. In fact, at least a few physicists who put Bell's theorem to experimental test are regarded as candidates for a Nobel Prize (these especially include John Clauser, Alain Aspect and Anton Zeilinger who shared the prestigious Wolf Prize- often a forerunner to the Nobel Prize- in 2010). In the end Kaiser wants to make the case that by keeping such once-disparaged philosophical concepts alive, the Fundamental Fysicists "saved physics". I am a little skeptical of this claim. They certainly managed to nurture and publicize the concepts, but it was the harnessing of these concepts by "real" physicists who were involved with the nuts and bolts of calculation and experiment that actually saved the concepts and kept them from turning into a purely philosophical mishmash. In addition, a lot of concepts that the New Age physicists bandied about belonged squarely in the realm of pseudoscience and the trend continues; people like Deepak Chopra commit gross violations of quantum mechanics on a daily basis. Unfortunately the line between science and non-science can be thin and one of the most intriguing discussions in Kaiser's book is this so-called "demarcation problem". How does one know if today's philosophy is tomorrow's cutting edge science or just noisy mumbo-jumbo? It's not always easy to say. Nonetheless, I think Kaiser and the Fysicists make a really great general case for why philosophical questions in science have their own place and should not be rejected. For one thing, they are always fascinating in themselves and demonstrate the endless human quest for meaning and reality; as recent discussions indicate, the philosophical conundrums in physics have been far from answered and continue to be explored through even more bizarre ideas like parallel universes and multiple dimensions. And as this wonderful book shows, at least in some cases these discussions may lead to key advances by influencing mainstream physicists who validate them by subjecting them to the ultimate arbiter of truth in science- hard experiment. Have you tried to read "The Tao of Physics"? I did. I couldn't make it through chapter one. Mumbo jumbo. Same thing with all the hubbub about quantum entanglement. One of my profs said it better than me: If you have two identical twins, one goes out to space, and the one on earth bears a child ten years later, the twin in space has instantaneously become an uncle. But that doesn't make for faster-than-light transferral of information. Ah. I always wondered why philosophy was glommed onto physics still, like a leech to a warmblooded animal. "Unfortunately the line between science and non-science can be thin and one of the most intriguing discussions in Kaiser's book is this so-called "demarcation problem"." It is a philosophical question (asking for a fast and hard division, nonetheless), so obviously useless. Conversely, it is the success, usefulness, of a science area that decides what is science (and showing why it is a fuzzy area, as expected in empiricism). James: Yes, I have. I was impressed with it as a teenager but it did not take long for me to realize that it was mostly mumbo jumbo. But purely from a philosophical viewpoint some of the ideas are thought-provoking. Sadly that does not make it science.